As part of our month long celebration, I've created a list of fun things to do each day during the month of December (the full list will be at the end of this post). Today's activity was to create some Christmas decor for the house. I've been stalking cute Christmas pictures on Pinterest for awhile. 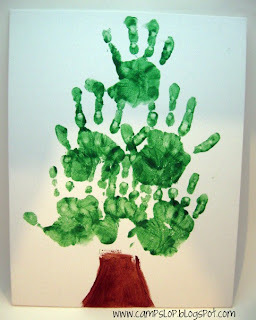 I decided to try three different pictures - thumbprint Christmas lights, handprint Christmas tree, and footprint reindeer. We used washable paint (for my sanity) on canvas panels. This one is my favorite I think. I love the bright colors of the lights. Pinky insisted she did not want to have a red nose (the original picture had all of the reindeer with red noses) because Rudolph was a boy. We settled on Chaos having a red nose with all the girls sporting black noses and a bow in their antlers like Clarice. I almost couldn't convince Wild One to let me paint her hand (hers is the lone handprint at the top of the tree), but once she tried it she wanted to paint her whole body! I still want to add a star at the top of the tree, but I love it even without it. These turned out SO much cuter than I had expected. My original idea was to display them for awhile and then toss them, but now I'm thinking of framing them instead. I think these would make great gifts for Grandparents or, scaled down, cute ornaments too (I've seen a version of the reindeer made from thumbprints floating around Pinterest). And as promised, here's our full list of December fun activities. I tried to keep things simple with lots of crafts and ornament making because that's what the kids enjoy most! So cute! 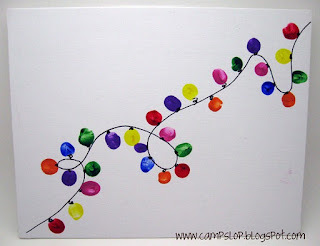 I love the holiday lights canvas the most! Thanks so much for joining our Home for the Holidays link party! Merry Christmas! So very darling and cute. I LOVE, LOVE, how you did these paintings on a Canvas and not just a piece of paper. What a great way to preserve them. I think we might just have to make these for Christmas Gifts for grandparents. Thanks for sharing and stop by sometime. Oh they are all adorable! Love love love! so cute! 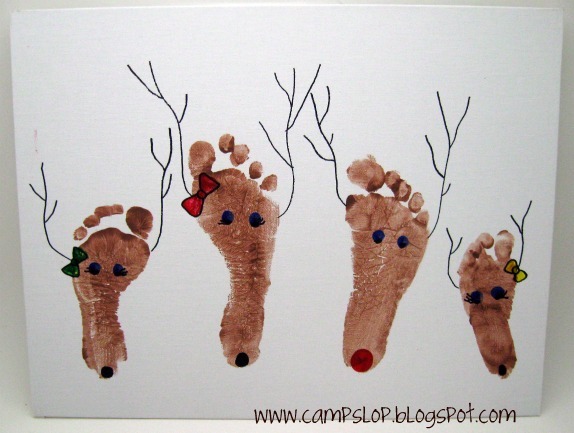 I have to say I like the reindeer feet the best! So sorry for the late reply. I am behind on everything. I am so glad you shared last week on Monday Madness.